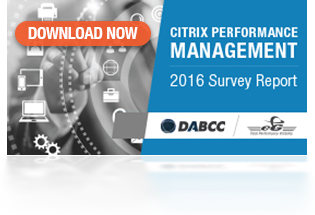 For the second consecutive year, DABCC and eG Innovations have conducted a comprehensive survey to explore the state of Citrix performance management and to better understand current challenges, technology choices and best practices in our Citrix community. Respondents comprise a representative cross-section of Citrix professionals, including administrators, architects, consultants, resellers and CSPs, covering all major industries. The survey results have been compiled into a data rich, easily digestible report to provide you with benchmarks and new insights into the best practices for Citrix monitoring and performance management. User experience is top of mind for Citrix administrators. Lack of ability to measure user experience is the top performance challenge for our respondents. 90% of respondents are not fully satisfied with the way they are managing their Citrix infrastructure. 67% need to use two to five tools to manage their Citrix infrastructure. 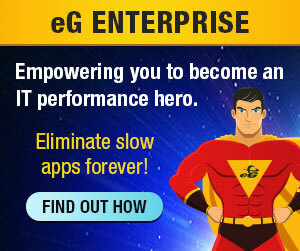 76% spend more than two days per week on troubleshooting. 88% of respondents would like to use a single console for monitoring and managing all the Citrix tiers in the infrastructure.